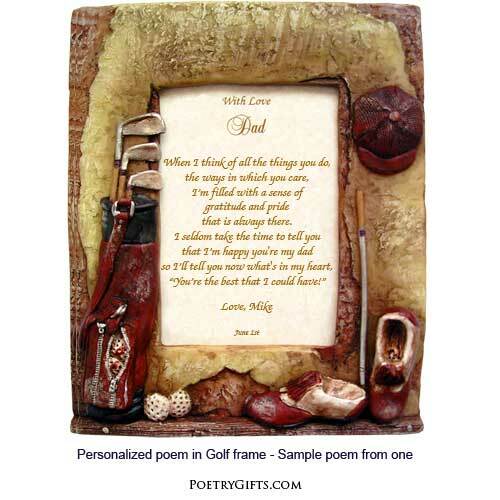 Golf frame and personalized poem combine for a custom gift for Dad or Daddy from his daughter and/or son. Personalize with names to make a special birthday or Father's Day gift for Dad. The original poem and rustic frame will look great on Dad's desk or dresser! Three-dimensional frame featuring golf clubs, golf shoes and hat surrounds a touching poem meant just for Dad. Outside dimensions of frame measure 5"x7". 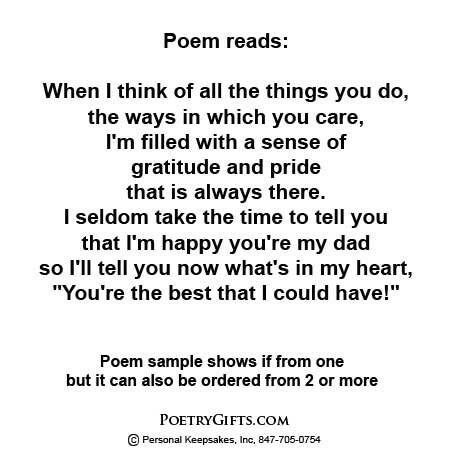 Poem can be replaced with a 3-1/2" x 5" photo. 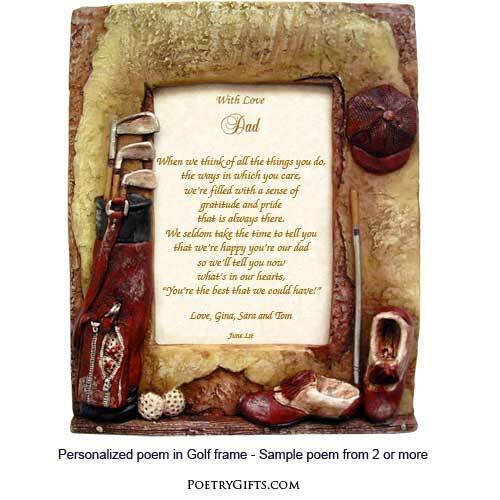 If your father is a golfer and you are looking for a special way to let him know how much he is loved, give him this Personalized Poetry Gift. It would make a great birthday or Father's Day gift for Dad. Or maybe you are going off to school and want to give dad a gift to let him know how much you will miss him...this would be a perfect gift. See the personalization questions above to create a meaningful and lasting keepsake for your Dad aka Pops, Daddy, Papa...! 4. Closing Phrase and Your Name(s) (as seen after poem) - (Examples: Love You, Julie; All Our Love, Zac & Eli; Hugs and Kisses, Ella; You're The Best, Josh; etc.)"